You are here: Home / Organization / Erin Condren Planner: Is the Life Planner For You? Erin Condren Planner: Is the Life Planner For You? It’s launch day! 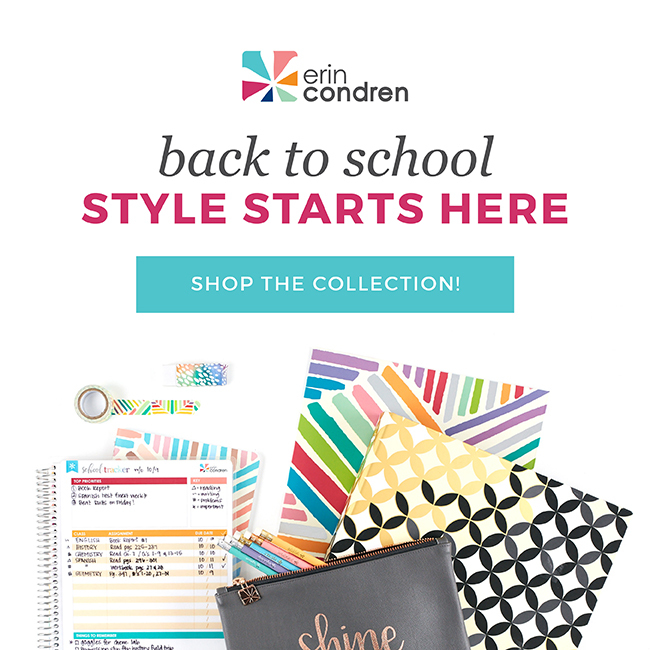 Celebrate the release of new patterns and accessories and snag an Erin Condren Planner! Erin Condren has it going on AGAIN this year! With a vibrant line of planners, accessories, and all things organizational, you have a wide variety of options this year to help you get focused. This is the academic planner release which means the calendars start in July. You can get a 12-month planner OR an 18-month planner that will take you all the way to December 2019. Here’s why I’m tempted to snag an Erin Condren Life Planner with an academic start time: I want all of my to-dos in ONE place. Over the course of the year, I’ve collected a few planners and calendars. I seem to have different tasks in different places, and it is difficult for me to just flip open a notebook to see what I have to get done for the day. And, an 18 month planner sounds AMAZING. Think of all the dreamy to dos I could write down and keep track of. I could really plan ahead and have a good record of my home and business with one big planner. Plus, aren’t these colors amazing?! There is room for you to write your goals inside, or you can use these pages for vacation plans, business ideas, or school calendars. The colorful vertical view is probably the most popular. It’s the classic style. I have used this layout for years, but I seem to switch between this and an hourly design. Here is a view at my 2016 hourly. The design has changed slightly but not by much. It is spacious and full of room to write your schedule. The hours are small enough that you can cover with washi tape or a sticker if you decide you don’t want to plan in the Erin Condren hourly. Every planner has stickers included which makes it really fun for adding color to your week. There are a lot of options to get your used to planning with the help of stickers. It’s amazing how adding a sticker can help you feel more productive, but it works! I’m also looking into the planner folio. It keeps everything together including your planner, pens, stickers, and more. The planny pack is also a ton of fun! It’s colorful and has room for your pens. It’s a tough choice, but what planner are you going to choose on launch day? The Erin Condren planner might be just what you are looking for! The Life Planner comes in three different layouts (vertical, horizontal, and hourly) along with two color schemes. Mix and match with a vibrant cover and get ready to plan! I have an Erin Condren planner and I LOVE it! I would be absolutely lost without it.